Ideally located in the heart of Venice,Tastefully decorated,romantic and Very peaceful.Pleasent terrace on the roof.Near the famous fish market of Rialto. Thank you Steve! I’m very pleased that you enjoy your apartement and your Time in Venice. Such a great location, a short walk to the Rialto bridge. This is a roomy, spacious apartment. The bathroom is large. It is on the 4th floor, no elevator, so pack lightly. But on the 4th floor is lots of natural light, even a balcony off the comfortable bedroom with a large bed and 4 US-sized pillows! The washing machine comes in so handy. This location is a short walk to the Rialto bridge, so in the middle of everything from restaurants, to shopping, to the Grand Canal. We absolutely adored staying here! We stayed from July 25 -30, 2017. The apartment is beautiful; a duplex with classic Venetian exposed-beam construction. It is comfortable and welcoming. It is charmingly and tastefully furnished. There is a cozy living room which leads into a spacious dining area and kitchen. The bathroom is large and has a beautiful sky light. The bedroom is located on a loft up a flight of stairs, and the terrace is off the bedroom. I loved waking to the light streaming in from the terrace and hearing the church bells, and sitting on the terrace in the evening with a bottle of wine while watching the sun set over the rooftops. We used the clothes washer (had to google instructions!) and hung them out to dry on the terrace rack. Very convenient! Location: It is located a very short walk from the Rialto Bridge vaporetto stop which is incredibly convenient for anywhere you want to go. It's about a 10 minute walk to St. Mark's. One caution- it is a 3rd floor walk-up with no elevator. It was fine for us, but if you are mobility-impaired, this might be an issue. Communication: The owner, Ghi, sent very clear instructions and was very helpful. Her mother met us at the vaporetto and led us to the apartment, pointing out useful information along the way. I didn't want to leave when it was time to go! We hope to return! Grazie mille, Ghi!!!! Hope to see you again in Venice!! Grazie mille! The apartment was clean, wonderful location, and spacious. Venice is an amazing city. It's close to the store, to the vaporetto line, rialto bridge, walking distance to san marco's square. 1. Our check-in process was stressful. We were told to wait at vaporetto line 2 Rialto for the owner's mother. We waited for 30-45 minutes and did not find anyone with the description. I was able to find wifi and emailed the owner several times and did not receive a response. I called both the owner and the owner's mother with no answer. Then I finally found her mother and she insisted that I was in the wrong place. I was literally 3 feet away from her... She said we should have been standing in the exit (since people were exiting though, we stepped to the side of that). Once we found her and checked in, it was fine, but the initial process was just confusing. I hope there is a better way moving forward. 2. The apartment was missing some useful items such as a guest book which could hold information such as check out instructions, what to do with the trash, any helpful notes for the guests who are staying. That would have been very helpful, especially because our wifi at the apt stopped working and we didn't know how to reset it. Also we did not know what to do with our trash. I emailed the owner and never received a response so we left it in the apartment. 3. Please upgrade the pillows for the bedroom. The bed was fine, firm mattress, but the pillows were useless. It was pretty bad, no support whatsoever, we actually ended up using the pillows from the couch as we could not use the ones on the bed. 4. The steps going into the apartment are slippery! It's the marble steps going directly into her apartment, they only have tread strips on every other step - so I slipped when coming down the stairs and badly hurt my back and elbows. Be careful when going up and down, especially with luggage. Other than that, our stay was enjoyable. Thank you for your suggestions, i will work on that. But i need to let you know that this is not the first year that i rent the appartement. Since 2002 i Never havé been problem about the Check in. Before coming i gave you all the instructions to meet my mother. She is Never late so i'm very surprise that you havé waited for 40 Minutes. The reason Why i havé give you her number is because i m not in charge with the Check in. I did not aswer because i was working. I gave you the right number to call , not my number. For the Check out my mother told you everything about. I take care of my clients , that 's why many people come back every year. This is the best satifaction. This suite was pretty sweet! Good amenities, well stocked (except no toilet paper!). Could easily stay here for a week or two. Improvements include providing local map of Venice with good (cheap) restaurants marked, and some work could be done on the patio to make it more welcoming (flowers, replace broken chairs, add some candles). Overall we were pleased. The apartment was as shown online. It has a great location and the owner, Ghi, is quite flexible. 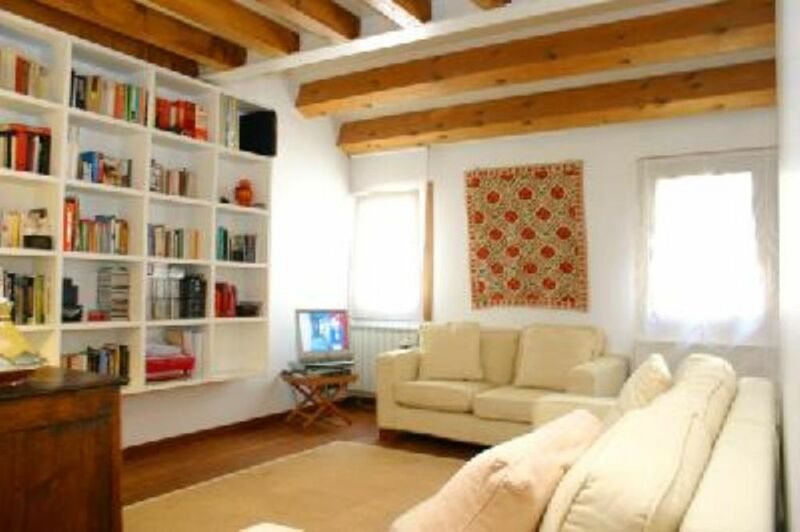 The apartment has a great location near the Rialto bridge. The accommodations were as shown and it was perfect for us. The host was also wonderful. 150 m to water bus station(RIALTO).Line 1 and 2. 1 km to train station and garage. Tariffe scontate in relazione alla durata, Tariffe in funzione del numero di persone, Richiesto supplemento aria condizionata in base alla stagione, Caparra richiesta alla prenotazione, Spese di pulizia finale, supplemento per arrivo notturno.